Why is it called a Smart Cover? Are you one of those people who uses their iPad Air 2 for virtually everything? Reading, playing games, checking e-mail and browsing the web? And all of this on the go? Then an iPad Air 2 Smart Cover from GoCustomized is exactly what you need to keep your device in mint condition. The smart cover is secured to the iPad Air 2 by using magnets. There is also a magnet placed inside the front cover which triggers your iPad Air 2 to go into sleep mode as soon as the smart cover is closed. This will help reduce battery waste and give you more time on your tablet. The smart cover can also be folded to act as a stand. This is especially handy when watching movies or your favourite TV show on the move. The smart cover also offers a great level of protection for your iPad Air 2. Can I make my own design for the front of the smart cover? Of course you can! Use any of your favourite pictures, images, patterns or pre-made designs to create your very own personalised iPad Air 2 Smart Cover. Personalising your smart cover is a quick and simple process. First you upload an image from either your computer, tablet or smartphone. You can also upload straight from Facebook and Instagram. If you currently don’t have any inspiration, don’t worry. Check out our Pinterest page for some cool ideas. Get started on your personalised iPad Air 2 case now. How can I order my Smart Cover? 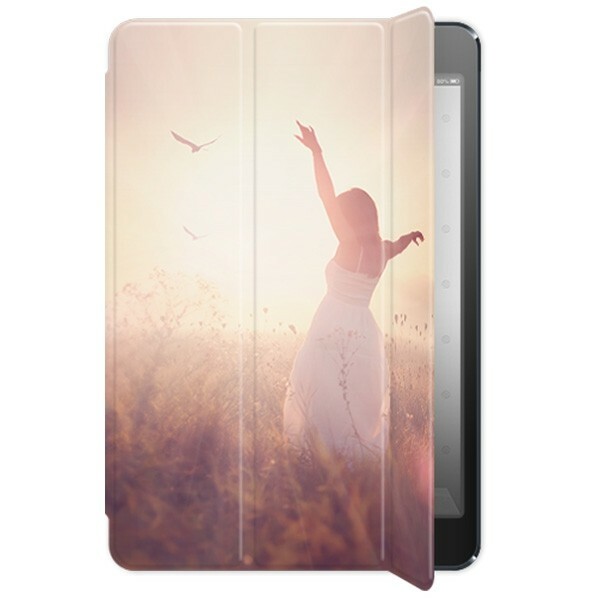 Once you are satisfied with your design, click the order button so we can get started producing your personalised iPad Air 2 cover immediately. We guarantee that your case will be on its way to you within 24 hours of purchase. Have any questions regarding your design or order? Please feel free to contact us via e-mail and get a response the same day on business days. I searched for custom cases and this is the place that stood out. Creation process is smooth and easy, and ordering too.